This guide is intended to answer the most common questions about the ordering, production and customization process. Please read and refer to this information before submitting your order. Once you've read The Curated Collection Guide, browse The Curated Collection to select your favorite design. If you're unsure about paper and printing quality you may order a sample packet first. Once you decide on a design you'll be asked to select a quantity, printing method, paper choice, and to provide some basic information such as your name, event details, font and color selections. You may also browse and order any add-ons you wish to include with your order, such as calligraphy addressing, extra envelopes, or wax seals. You will receive an email confirmation of your order upon checkout. Within 1-3 business days, I will send you an email to gather the exact wording for your project, discuss your choices and options, confirm your production time frame, and to ask you any questions I may have following the review of your order. Within 2-4 business days a PDF proof will be emailed to you. This digital proof will show all aspects of your design with relative sizes. Ink colors, papers, and envelopes will be displayed digitally to mimic the colors and quality of your chosen design. Please proof all text, calligraphy, and design elements carefully, as I am unable to make changes once the design is sent to print. Two rounds of revisions are included in the price, however revisions to the design template and calligraphy style are not included in the customization process. Revisions exceeding the second round of changes will be billed separately as a flat fee of $100 per instance, unless given prior approval. The timeliness of proof approvals during this phase will impact your delivery date. Once you have approved the PDF proof, your order will go to print. Please note that no further changes may be made following final approval. The timeframe for production is approximately 3-4 weeks, with an additional 2 weeks for addressing services, but your shipment date depends on the scope of your project. Please inquire if you need a specific estimate for your project. Your order will be carefully packaged and shipped to the address you listed at checkout, unless requested otherwise. All outstanding invoices must be paid prior to shipment. I'm happy to offer two of the highest quality printing methods for The Curated Collection, described below. 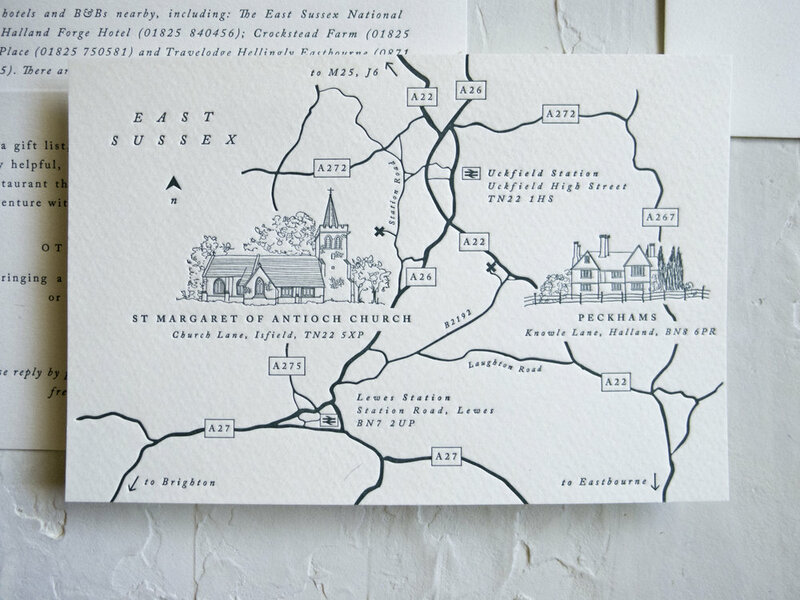 Letterpress printing produces a luxurious, tactile piece that is reminiscent of the good old days. Polymer plates are inked and loaded into antique printing presses that leave a crisp impression in the paper, giving greater visual definition to the type and artwork. 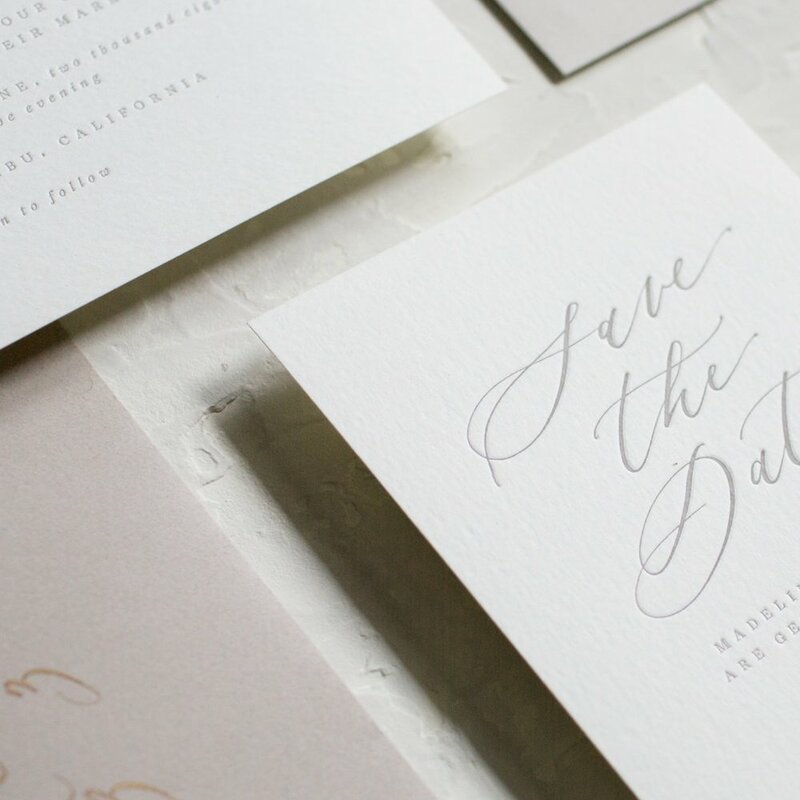 Letterpress printing, which requires the a press operator to hand feed paper one sheet at a time, has been revived in artisanal form and is therefore perfect for special occasion printing. Letterpress inks are matte and mixed by hand. Foil stamping is perfect for eye-catching metallic designs. The press uses heat and pressure to adhere a thin metallic foil onto the paper in lieu of ink. To achieve this, a copper plate is created with your custom artwork. On the press, it comes into contact with the foil and transfers a thin layer onto the paper with a slight impression. Flat printing is the most economical method of printing, but works great for a clean, modern aesthetic or multicolored designs. Ink sits flush with the paper, small lines and typography appear delicate and crisp, and watercolor elements print as if the paper was painted directly. I do not offer flat printing through this website, but 4 of the original designs from The Curated Collection plus 2 additional watercolor designs are available through Huntsville Paper Co! Huntsville Paper Co. is a collaboration with a local stationer and friend, Jacki Gil of Salt + Paperie. We're happy to offer high quality, quick turnaround semi-custom designs. Items purchased from Huntsville Paper Co. have their own customization options which you may read about here. Although flat printed items are purchased through a different website, you will still work directly with me throughout the proofing and design process. If you have any questions about this route, please drop us a line in the contact form. Shop Flat Printed Designs at Huntsville Paper Co.
All invitations, inserts, and save the dates from The Curated Collection are printed on Arturo Soft White paper with the option to upgrade to a deckled edge in the add-ons section. Arturo papers are created in Italy by Cartiere Magnani, which was founded in 1404 and has served many of Europe's reigning families and governments, including a wedding announcement for Napoleon Bonaparte! These mouldmade papers have a soft, luxurious feel made possible by Magnani's proprietary "corona" felt finish. Arturo's soft white is the perfect creamy backdrop for a range of letterpress inks and foils. The soft felt texture adds tactile interest without overwhelming the design. You may upgrade to deckled edge cards which feature a soft feathery edge instead of a clean cut edge. This unexpected feature can take a organic or traditional design to the next level or soften a modern aesthetic. Foil stamping is available in gold, copper, rose gold, or champagne. The depth and dimension of metallic foil colors is difficult to convey with a computer screen. Please inquire if you'd like to see a foil sample in person, or reference the Laurel Suite to see an example of copper foil or the Jessamine Suite to see an example of champagne foil. Matching 'soft white' or 'stone' envelopes are manufactured by Arturo, which is the paper that is used for all printed pieces. These Arturo envelopes offer a unique flap shape as exhibited in the photo. Outer envelopes, ungummed inner envelopes, and reply envelopes are available in this style, as are envelope liners. You may download the template above or start with a clean spreadsheet and duplicate the column set-up. Be careful to not add tabs, extra spaces, or line breaks within cells. These will display as unnecessary glyphs when auto filled into the envelope printing file. Enter your guest information exactly as you would like it to appear on your envelopes. All salutations, capitalization, and punctuation should be indicated. For names or addresses that you would like to have on a second line, use a semi-colon ( ; ) to denote the line break. You may omit or ignore the second column—“Inner Envelope Name(s)”— if not printing inner envelopes. Add additional rows as needed. You will receive 1 digital proof of your envelopes before printing and 1 round of edits. The digital ink will be matched as closely as possible to your invitation ink or printed in black or gray. *Return address printing on the back of your outer envelopes and front of your reply envelopes is included in The Curated Collection pricing. Calligraphy is available for outer and inner envelopes only, since return and reply addresses are pre-printed. To request calligraphy addressing, please purchase the service from the add-ons page. Before you add the service to your cart you will be prompted to select a delivery date. If an appropriate month is not listed that means I am booked up for calligraphy services at that time. If calligraphy services are unavailable for your timeline, I highly recommend considering digitally printed addresses as a beautiful alternative (also purchased from the add-ons page). Or send me a note in the contact form and I will gladly send over a list of trusted calligraphers who may be able to assist with your project. To make changes to your list, email only the changes, not the entire list again. Changes to the list will be billed at $10/instance. Calligraphy spelling errors or missed envelopes will be replaced at no cost within 1-3 business days. Last minute additions or spelling errors on your list may be replaced at cost with the addition of a $20 late set-up fee. Reasonable requests for re-dos will gladly be considered, but are not guaranteed. Calligraphy addresses must be in a plain text format, such as Microsoft Word. Spreadsheets will need to be converted. Addresses and wording should appear exactly as you want them to be written, with all salutations, capitalization, and punctuation indicated. Abbreviations should be spelled out. Please drop zip codes to the last line. If a full line on your list will not fit on the envelope, a line break will be added. 20% extra envelopes must be purchased to cover mistakes. Most calligraphy orders will add 2 weeks to your delivery, but it's also wise to allow 1-2 weeks to check for errors and request replacement envelopes if needed. 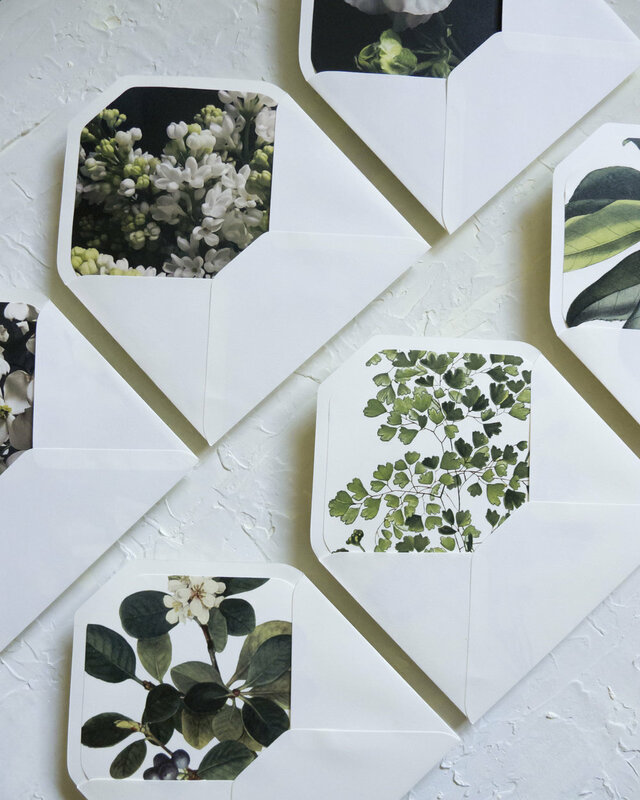 Choose your favorite of 6 envelope liner options from the Old Frond x Linen & Leaf collection or the Vintage Botanical collection. These come pre-installed so there’s no extra work on your end. You may purchase additional outer envelopes with your return address printed as well as blank inner envelopes. If you are planning to use an outside calligrapher, be sure to ask how many extras they require (usually between 15-25%). You may also want to order extras if you or a family member will be addressing envelopes. Custom map illustrations add a fun, personal touch to your wedding suite. This add-on is for the digital artwork only. To have it printed, please add an extra insert to your cart from the main collection ordering page. Space permitting, most map illustrations can accommodate 3-5 landmarks, buildings, or points of interest along with the main roadways and landscape features surrounding your wedding venue(s). Another fun way to personalize your suite is with a sketch of your ceremony venue, reception venue, or other point of interest. This add-on is for the digital artwork only, but may be incorporated onto an extra details insert or elsewhere in the design, space permitting. Custom wax seals are a great way to add vintage flair or interest to your wedding paper goods. Your wax seal design can accommodate 1 or 2 initials, or a full monogram if included in the design you chose. Wax seals are also a great addition to your personal stationery set or thank you notes after the wedding. Sealing wax is not included, so I recommend purchasing glue gun wax to make quick work of sealing. All you need is a standard sized glue gun, preferably one with a low temperature setting. My favorite vendors for glue gun wax are: Back to Zero, Waxseals.com, and Nostalgic Impressions. Be sure to take a sample stuffed and wax-sealed envelope to your local post office for an exact quote on postage required. You may also want to ask about having your invitations hand-cancelled to avoid running the seals through the mail sorting machines that may damage to the delicate seal. Some post offices are more willing to hand-cancel than others, so you may have to ask around. The following guidelines should be applied to traditional weddings, but your invitation should be a reflection of your celebration. Don't be afraid to bend the rules to fit the style and tradition of your wedding. This is the start of your invitation and immediately indicates who is hosting the wedding. Traditionally, the bride's parents are the primary hosts, but this tradition is changing. Many families contribute equally to the wedding and it is becoming more common for couples to host their own. It's best to select the wording that honors your families and fits your celebration the best, whether it lists names and families specifically or a more broad mention such as "Together with their families." The bride always comes first. If the bride’s parents are hosting, her last name is omitted because theirs precedes her. If divorced parents are listed in the host line, then her last name is added for clarity. If the groom’s parents are also listed in the host section, both the bride’s and groom’s last names may be omitted. It is equally correct to leave them in and is up to your discretion. It is also optional to add a line right after the groom’s name to honor his parents. This is called a “Son of” line and reads like this: Son of Mr. and Mrs. John Doe. For casual ceremonies first names may be suitable. Capitalize the day of the week, month, and first letter of the year. 4pm is considered afternoon, but 5pm and later is considered evening. This line should list the name of the location with city and state noted underneath and spelled out in full. If your celebration is being held at a private home or at a location with an unlisted address it is appropriate to list a specific street address. If you are marrying at a church that could be confused with another church of a similar name in the same town, this is another instance in which it is appropriate to include a street address. Abbreviations should not be used in any addresses on wedding paper. Traditionally, attire is not mentioned on the invitation. For modern formal wedding invitations, it is has become acceptable to print “Black tie” or “White tie” on the lower right corner of the ceremony card if the reception is mentioned on the ceremony card and if the ceremony does not take place in a house of worship. In any other circumstance, nothing should be printed on the bottom right corner. If you still feel the need to inform guests of a formal dress attire, the language should be “Black tie” or “White tie” on a separate reception card. A few extra things to keep in mind when selecting wording. Registry information: This should never be included on your invitation, or in your invitation suite at all. Instead, include registry details on a wedding website and note the website on your save the dates and perhaps on a details insert in your invitation suite. Post office handling: To make sure your invitations arrive looking their best, it is recommended that you have your invitations hand-cancelled. Hand-cancelling is a process where a postal worker stamps your envelopes by hand to zero out the postage rather than running the envelopes through a machine. This is usually reserved for square, thick, or irregular envelopes and requires additional postage. Unfortunately, not all post offices are willing to hand-cancel. Small suburban post offices are usually your best bet and it's a good idea to call ahead of time and ask if the service is available and if so, their preferred time of day. Postage: Beware, if you send out your beautifully addressed and sealed envelopes with insufficient postage they will be returned to you and possibly ruined with a large stamp or sticker. The horror! Stamps may seem straightforward, keep in mind, extra thick or heavy invitation sets, or suites with a seal, bow or other addition creating a “bump” will require additional postage, often at the discretion of the postal worker handling your suite. The “rigidity” of an invitation can be subjective so be sure to check in with the post office you will be mailing from and have them weight and test an actual set you will be sending to make sure you are covered when it comes to the postage amount. A block of rooms has been reserved for our guests at a discounted rate. Please reference the Connor-Smith Wedding when making your reservations.